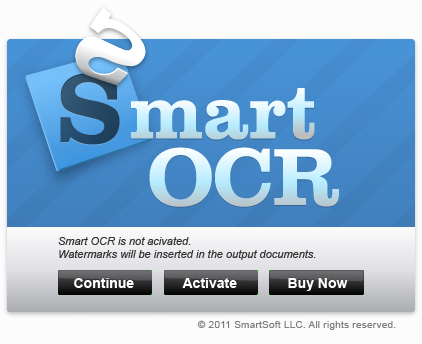 You must activate Smart OCR in order to use its full functionality without limitations. You can activate the program by using a license key. If you don't have a license key please read the next sections (Getting a license key and Activating the application). If you already have a license key and want to activate your application, read Activating the application section from this page. First step to activate your Smart OCR is getting a license key. You can use the Buy Now button in order to purchase a license and to activate your Smart OCR using your license key. Using the Buy Now button from Image View or Text View windows. Using Buy Now link from Start Menu folder of Smart OCR. Using the following web page http://www.smartocr.com/order.htm from the web site of Smart OCR. Please ensure that web access is available before activating Smart OCR. You have to enter your license key and press the Activate button from this dialog. Soon Smart OCR will be activated and you can use it without limitations.